It’s Christmas, a wonderful time of sharing! 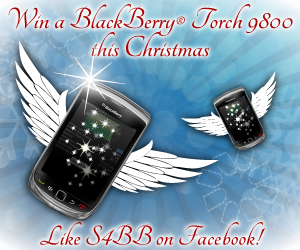 For this holiday season, we are giving away a brand new BlackBerry® Torch 9800 for FREE to the winner of our Christmas sweepstakes! All you need to do is like our Facebook page. If you are already a fan on Facebook, just join the sweepstakes here. Christmas time means sharing, so we will give you 5 extra entries for every friend who joins the sweepstakes as well. That’s it! Join our Christmas sweepstakes now! On behalf of the whole S4BB team, we wish you a wonderful holiday season! Next Next post: Barcode Scanner – Read QR-Codes with your BlackBerry Smartphone!